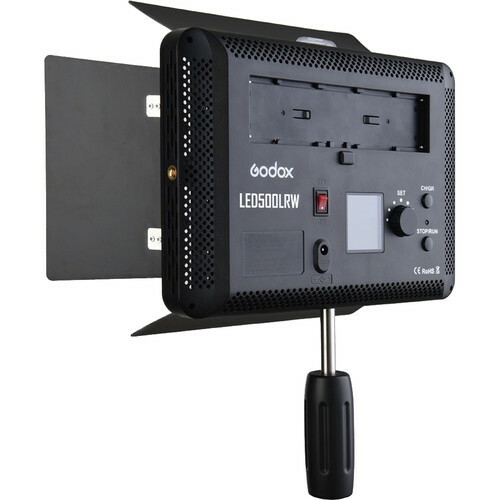 Daylight LED500LR Video Light from Godox provides a powerful, even beam of light in a small form factor. The light has a color range of 5600K ±300K and, depending on settings, controllable brightness from 10 to 100%. Settings and other adjustments can be made on the light itself through the control panel or on an included wireless remote that works at distances up to 65.6'. The LED500LR is rated for output up to 2900 lux at 3.3', drawing a maximum of 32W of power during use. The light has a built-in filter slot for light manipulation and also comes with a handle for handheld use. Power for the panel comes from either two Sony L-series batteries (not included) or via the included DC power adapter.